Can Mentoring Ease Generational Tension in The Workplace? 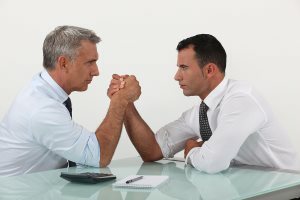 Now I am not suggesting that there is a full-scale generational war going on in the workplace, but few would argue with the existence of a generational gap within the four generations (Veterans, Boomers, Gen X and Gen Y) – which can lead to some degree of disconnect. Take the findings of the 2011 poll by the SHRM, reported in the Fiscal Times, which showed some of these differences. For example, they revealed that 38 percent of older workers were concerned about younger workers’ inappropriate or excessive dependence on technology, and 31 percent of younger workers responded that managers had an aversion to technology. The survey also found that 47 percent of younger workers felt that older workers micro managed and were resistant to change, and 33 percent of older workers found that younger workers’ level of informality, need for supervision and lack of respect for authority were problematic. So, while there isn’t an all out war, there are clearly tensions between the generations. Many would argue these tensions have always been there, but the generational range and diversity is broadening as we, for the first time, have four generations working alongside each other in the workplace. And with retirement ages getting older, due to economic necessity and better well being into old age, we can only expect the generational range to broaden further. This means that tensions that arise from generational divides may intensify, and they will also begin to negatively impact team cohesion, which makes the organization less efficient and competitive. It makes sense that organizations start focusing on initiatives that can help to unite the generations. This means that organizations should begin to consider inter-generational adaptability as a key selection criterion for new hires and promotions and also begin to actively develop these skills within their businesses. Can Mentoring Bridge the Workplace Generation Gap? But, another almost tailor-made tactic for addressing the generational divide is staring us right in the face. It’s known as a mentoring program, which is where an organization enables younger or less experienced workers to connect with older, more experienced workers in a non-supervisory capacity for coaching and mentoring in the ways of the world, business and people (think Luke Skywalker and Yoda). In a study reported in the Diversity Journal of workers from across the generations (38% gen Y, 32.8% Gen X, 24.1% Boomers, 4.3% veterans), they found that a massive 75 percent of them thought that a mentoring program would be beneficial. Mentoring programs can help to build bridges between generations helping them to become familiar with each generation’s differences and strengths, but they also bring individual benefits for both mentee and mentor. even benefit from reverse mentoring in the areas of new technology and emerging trends. So, a mentoring program can not only be of great benefit to younger and older workers, it can help to bridge the generational divide and reduce generational tensions, leading to greater team cohesion and organizational effectiveness.